The University of Virginia was Thomas Jefferson’s crowning architectural achievement. The overall design for Central College, based on his 1814 plan for Albemarle Academy, was approved by the Board of Visitors of Central College in 1817. The University of Virginia was established by the Virginia General Assembly on January 25, 1819 and took over Central College’s assets. The pavilions and dormitories were largely complete by 1822; the Rotunda and Anatomical Theatre were completed in 1826, after Jefferson’s death on July 4, 1826. Classes began at the University of Virginia on March 7, 1825 with five professors and about 40 students. The Academical Village is a 28-acre site occupied by a U-shaped complex of buildings with the Rotunda, originally containing classrooms and the library, as the focus at the northern end of the Lawn. The east and west sides of the Lawn contain five pavilions each, which served as faculty housing and classrooms, with student dormitories interspersed between them. Running parallel to the east and west sides of the Lawn are the East and West Range, which face outward. 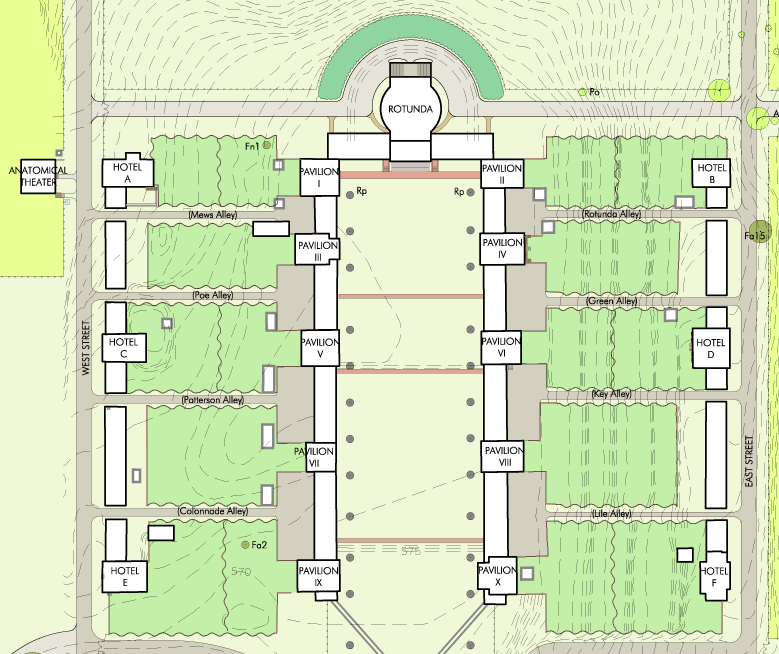 Each range consists of three hotels (which served as dining spaces and attended to other student needs) interspersed with student dormitories. Between the Lawn and Range on each side of the Academical Village are walled gardens, which served the needs of both professors and the hotelkeepers. The original Academical Village also consisted of the Anatomical Theatre, which was located across what is now McCormick Road, and dozens of outbuildings, most of which no longer exist. Two pavilions (now Pavilions III and VII) were already under construction when the University of Virginia was established in 1819. Instead of being built all at once, pavilions, hotels, and dormitories were approved for construction as funding became available; Thomas Jefferson designed the pavilions in detail as they were approved. He based his designs on a number of classical models, including those published by Andrea Palladio, Fréart de Chambray, and Charles Errard; each pavilion is unique, and he made his own changes to the models he chose. In the spring of 1816, Jefferson wrote to Governor Wilson Cary Nicholas about his plans for the design of the pavilions, stating, “…more may be said hereafter on the opportunity these small buildings will afford, of exhibiting models in architecture of the purest forms of antiquity, furnishing to the student examples of the precepts he will be taught in that art.” He made similar comments in a letter to craftsman James Dinsmore in April of the following year. Jefferson hoped that his design for the Academical Village would elevate Virginia architecture and serve as inspiration to the young men he was educating. 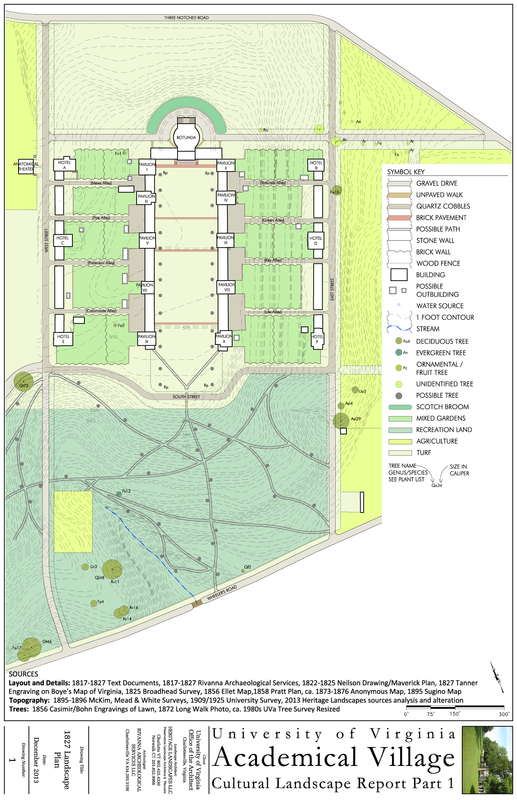 The goal of the JUEL Visualization project is to create a digital reconstruction of the Academical Village circa 1827, after its completion but before major changes were made to Jefferson’s original design. The Academical Village has been greatly altered over the years, and though there have been restorations to return to some Jeffersonian elements, it is not feasible to restore it to its original condition. A digital reconstruction gives us a comprehensive view of Jefferson’s Academical Village, and allows us to make changes as new evidence is uncovered. The Academical Village as it functions today is quite different from how it originally operated, and is something we hope to portray in the reconstruction. It was more of a self-sufficient town than the park-like tourist destination it is today, with the gardens between the Lawn and Range producing food, professors keeping livestock, and the surrounding landscape consisting of agricultural land. There is documentary and archaeological evidence of dozens of outbuildings that sprang up in and around the Academical Village to support everyday life, including kitchens, privies, stables, and smokehouses. The important role that slavery played in the development of the Academical Village is also something we hope to communicate, as the University could not have been built or sustained without the labor of enslaved individuals, whose presence has nearly been erased over the decades. The digital reconstructions are based on a wealth of information, including Historic Structure Reports commissioned by the Office of the Architect, scans of original drawings and documents provided by the Albert and Shirley Small Special Collections Library, historic photographs found in the UVA Library’s Digital Repository, architectural drawings provided by the Facilities Management Resource Center, the 2013 Cultural Landscape Report, as well as other books written about the University and the expertise of University historians. Many of these resources are available to the public online. Thomas Jefferson to Wilson Cary Nicholas, April 2, 1816, Jefferson Papers, University of Virginia.